The severe winter has brought damage to landscapes that we’ve not seen in a great many years. 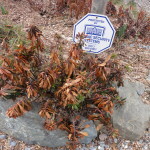 Some plants that have been very winter hardy here may appear to be dead or very heavily damaged. Some will recover later if the damaged/dead plant parts are trimmed off. I recommend delaying wholesale cutting off of winter burnt foliage until the temperatures remain above freezing. Even the unsightly brown/dead foliage serves to shield and protect tender new leaf or flower buds until the temperatures climb. As we begin spring cleanups, we’ll advise how to tackle damaged plantings on a case-by-case basis. Certain types of plants are hit the hardest in this type of winter — e.g., broadleaf evergreens, whose large exposed leaf surfaces are dehydrated by damaging winter winds. I’ve seen numerous shrubs and trees, which typically have fared fine over recent winters, exhibiting a lot of damage this year. These include Holly, Magnolia, Camelia, Cherry laurel, Rhododendron, Viburnum, Sweetbox, Nandina — the list goes on and on. Most of this damage will not result in plants dying. Soon, the dead foliage can be removed — branches/twigs that are dead can be cut off — to make way for new growth. It may be several months — almost into summer — but many plants will rejuvenate nicely. If in doubt about a plant’s viability, you can try to scratch the stems of affected plants, and if tender (usually green) tissue is present, the plant still has life. 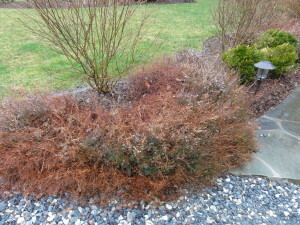 If you are now, or might in the future be, in the market for new evergreen plantings, take note of how things look during a terrible winter such as the winter of 2013-2014, and perhaps consider adding to your landscape those specimens that survived well. Buxus ssp — Boxwood (many varieties), Mahonia bealei, and Cephalataxus harringtonia (Japanese Plum Yew), along with other conifers, held up exceptionally well. 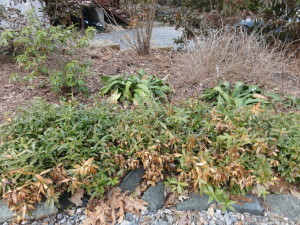 For the past several years, plants that previously had thrived in more southern landscapes, have become commonplace in Maryland due to the generally warming winter trends. These may not have survived this brutal winter (examples would be Crapemyrtle, certain Camelias, and the repeat blooming Azaleas.). Some may need to be replaced. 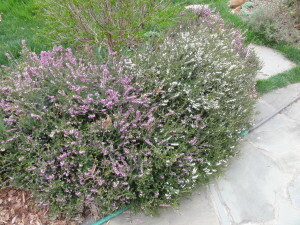 Some plants may not exhibit their full damage until later in the spring (i.e., a delayed reaction). Some plants are damaged from root rot (e.g., Rhododendron do not tolerate a lot of soil moisture, which they’ve had this winter). As the effects move up from saturated roots through the plant, it may exhibit a slow deterioration (and maybe demise) later in the spring. In addition to plant damage or death due to the extreme cold and wet, many trees and shrubs were badly damaged by heavy snow and ice. This happens in nearly every winter. Just be sure to take stock of such damage. Broken branches should be carefully removed, and any ‘stubs’ evenly sawed off at the appropriate juncture point to help prevent insect and disease damage from taking hold. Note: all photos by Connie J. Bowers, Garden Makeover Company, unless otherwise noted.